California Artist Memorializes Pets. Denice Lewis' pet tribute paintings combine cremated ashes with pigments. Los Angeles-based artist Denice Lewis had an affinity for animals ever since she was a child. As an adult, she helps pet owners honor the life of a pet through tribute paintings. She mixes ashes into bright, metallic pigments to create an abstract interpretation of a pet’s life on canvas. 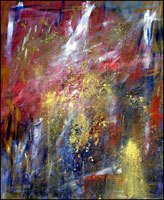 The result, she says, evokes the spirit of a loved one using vivid colors. The purpose of her tribute art, she says, is to give people an outlet for healing after a family member, human or pet, passes away. Her artistic expression is also a form of therapy for her as she faces challenges with her health, including fibromyalgia. Her creations tend to be “happy,” she says. Not all paintings include cremated ashes, but they are all meant to be a joyous way to remember somebody’s life. To her, a pet can be “somebody” as well. Colleen Mihelich, owner of Peternity.com in Brea, Calif., says the tribute paintings that Lewis creates help pet owners move on to the next stage of the grieving process. Rather than focusing on a loss, pet tributes are meant to offer a brighter outlook. In addition to pet memorial paintings, Mihelich says people also invest in pet grave markers, urns, keepsake jewelry and garden statues. The majority of her customers look for cat and dog memorials, but other pets that people pay tribute to include birds and horses. “Hers is definitely very spiritual,” she says of the tribute artwork by Lewis. Each painting varies in size and price, depending on the materials used. Lewis, a former supermodel, works out of her home studio. Several of her pieces are on display in galleries in Hawaii, New York and Los Angeles.